Rep. Jim Bridenstine (R-Okla.) at his Nov. 1 confirmation hearing to become NASA administrator. The Senate Commerce Committee voted on party lines Jan. 18 to advance his nomination to the full Senate, along with Barry Myers to be administrator of NOAA. WASHINGTON — A Senate committee voted on party lines Jan. 18 to advance the nominations of individuals to lead NASA and the National Oceanic and Atmospheric Administration, although with no clear indication of when, or if, they will be confirmed by the full Senate. The Senate Commerce Committee voted 14–13 to advance the nomination of Rep. Jim Bridenstine (R-Okla.) to be NASA administrator, and by an identical margin advanced the nomination of Barry Myers to be NOAA administrator. In both cases all the committee Republicans voted for the nominees, and all the committee Democrats voted against them. It was the second time that the committee voted to advance their nominations to the full Senate. The committee voted on Bridenstine's original nomination Nov. 8, and Myers' nomination Dec. 13. The nominations also advanced along party lines in those earlier votes. The committee had to vote again on the nominations because the nominations were resubmitted by the White House. Under Senate rules, nominations not voted on by the full Senate at the end of its first session are returned to the White House unless there is unanimous consent among members to hold them over. The White House resubmitted the nominations of Bridenstine and Myers Jan. 9, along with several dozen other nominations that the Senate returned when the new session began in early January. Although the committee considered seven nominations in the same session, the vast majority of comments by members focused on Bridenstine's nomination. Sen. Bill Nelson (D-Fla.), ranking member of the committee, again expressed his opposition to the nomination, arguing that Bridenstine was unqualified to lead the space agency. "The facts of this nomination have not changed," he said of Bridenstine. "He has no experience managing a large organization or program, no background in science or engineering, and a history of political divisiveness." The agency, he concluded, "needs a unifying force and a qualified space professional." Several Republican senators rose to Bridenstine's defense. "He has a lot of experience," said Sen. James Inhofe (R-Okla.), describing Bridenstine's work on House committees dealing with space policy. "I think that anyone who takes this position as director of NASA is going to have to be someone who can speak the language of Congress, can walk the halls, express the needs of NASA. He certainly is qualified to do that." "He has many of the characteristics similar to our own astronauts," said Sen. Ted Cruz (R-Texas), citing Bridenstine's experience as a naval aviator. The prospects for Bridenstine's confirmation by the full Senate are no better now than when the committee originally advanced his nomination last November. Republicans hold a narrow 51–49 edge in the Senate, meaning they can lose only one senator's vote and still win passage, using the tie-breaking vote that would be cast by Vice President Mike Pence. While no Democratic senators has announced their support for Bridenstine, one Republican senator, Marco Rubio of Florida, expressed concerns about the nomination when it was originally announced last September, statements Nelson alluded to in his remarks. A spokesperson for Rubio did not respond to a request for comment Jan. 18 about the senator's position on the nomination. In addition, two Republican senators, Thad Cochran of Mississippi and John McCain of Arizona, have missed time in recent months because of health issues, and McCain has yet to return to the Senate after the new session started early this month. 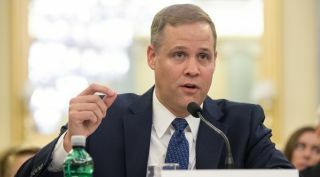 Nelson argued it was time for the Trump administration to withdraw Bridenstine's nomination and offer an alternative to lead NASA, suggesting Bridenstine lacked the votes to win passage. "You can count votes, and I don't say anything is solid and sure until it actually happens, but it's my hope that, sooner or later, we can move on to a qualified candidate who would quickly be confirmed with broad bipartisan support," he said. Bridenstine retains strong support within the space industry and broader space community despite the ongoing nomination battle. In a press release shortly before the committee vote, Bridenstine announced that his guest for the Jan. 30 State of the Union address would be Bill Nye, chief executive of The Planetary Society and someone who is best known as "The Science Guy" from a long-running television series. "I have enjoyed a productive working relationship with Congressman Bridenstine on space issues," Nye said in a statement about being Bridenstine's guest at the speech. "The congressman is the nominee to be the next administrator of NASA, and as I often say, NASA is the best brand the United States has." With the Senate unlikely to take up Bridenstine's nomination for at least several weeks, NASA will continue to be led by Associate Administrator Robert Lightfoot, who will mark one year as acting administrator on Jan. 20. That is far longer than any other acting administrator in the agency's nearly 60-year history. Lightfoot, speaking at a Center for Strategic and International Studies civil space forum Jan. 18, joked about setting the record for longest-serving acting administrator. "Having the record for the longest-running acting administrator, for those of you who are Bull Durham fans, that's like having the minor league home run record," he said. "Nobody knows or cares."